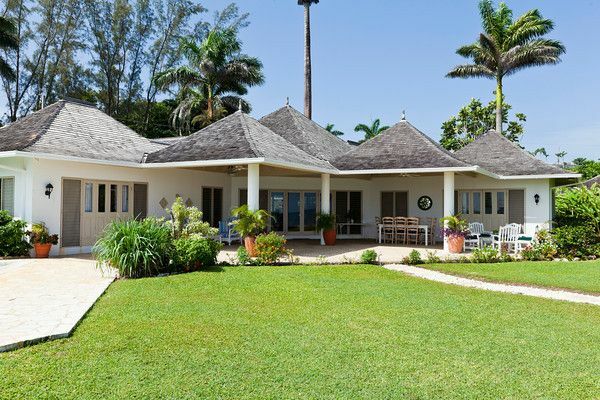 Sunrise is a classical beach cottage with an enviable oceanfront location and its own private sandy beach. The lovely laid-back atmosphere is just perfect for such a magical location. The Golf Club House is moments away and the main Club private beach and water sports are just a short stroll. The villa has a very private feel to it; you enter via a sold front door from Country Club East into a planted courtyard and thence the house. Right before you is the ocean, a very spacious veranda and a lawn for children to play on. The living room is simply furnished with Jamaican wicker furniture in the sitting area; there is a separate dining area as well as a bar. Outside is a large dining terrace that faces the sea. Here there is plenty of space to relax as well as dine. Three of the bedrooms are within the main house; one has a king bed and the other two bedrooms which are of an unusual shape have twin beds. The fourth bedroom is in a separate cottage and has a king size bed. Outside, manicured lawns and a swimming pool with a panorama of beach and sea make Sunrise a true outside-in home. Sunrise also has a small organic kitchen garden, the produce from which is used for the benefit of guests staying here.